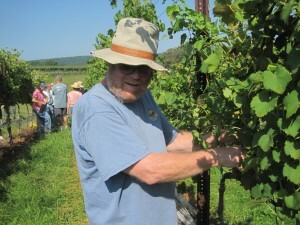 An unguarded moment picking grapes at Blenheim Vineyards — mostly I had my eyes on my work while using pruning shears to snip clusters of grapes. business, and there are a lot of tough decisions to be made, especially in a growing season that has featured too much rain at the wrong times. (Thank you, Irene.) 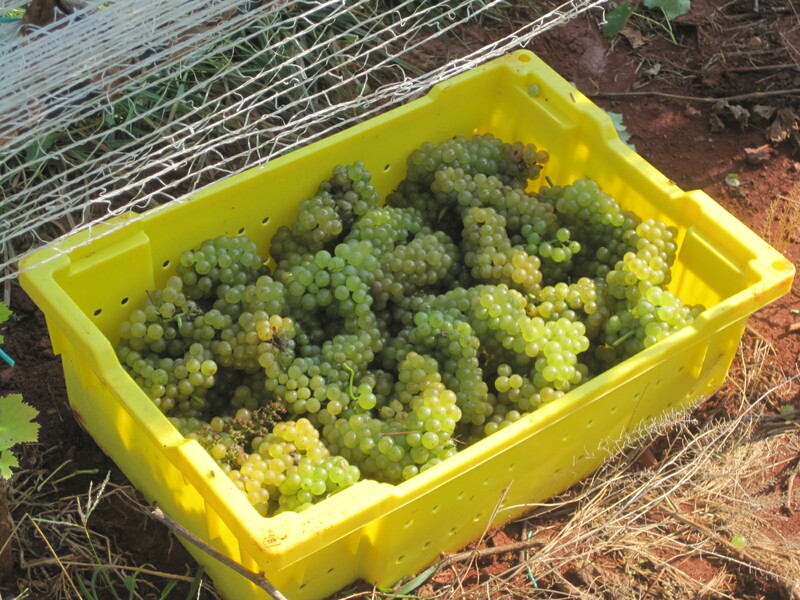 Sometimes it comes down to a compromise – do I pick the grapes now, when they’re not quite perfect, or wait and hope that weather doesn’t get in the way and cost me the entire harvest? It’s an especially troublesome set of decisions now, in the midst of the 2011 harvest, for several reasons. For one, the wet conditions are a breeding ground for disease, particularly Downy Mildew and Botrytis, and spraying isn’t always possible in these last weeks. That’s a problem for this year, if you’re trying to avoid issues such as sour rot, and it’s a problem for next year as well. Mizuho Nita, a grape pathologist at Virginia Tech, notes that while the berries (grapes) should be resistant to Downy Mildew, vineyard managers need to be concerned about the effect of disease on the canopy. “Vines need healthy leaf areas for accumulation of carbohydrate into the main trunk in order to survive the winter,” he said in a recent blog post. In addition, the grapes swell with water after a rain, which dilutes the wine that would be made from them. Brix levels (a measure of the sugar and potential alcohol) drop after a big rain, and the skins may crack, which is a cause of sour rot. Moreover, the skins, which provide color and tannin to reds, may be too thin to do their job well. “Mother Nature certainly isn’t doing us any favors with all of this rain and the never-ending dreary days,” says Sharon Roeder, winemaker at Barrel Oak Winery (BOW, for the dog-lovers among you – and who isn’t a dog lover!). Despite the weather, Sharon says she’s still pleased with what she’s seeing from the harvest – at BOW, they’ve already brought in Seyval Blanc, Chardonnay, and Vidal Blanc – but the year will be challenging for winemakers, she says. At DuCard Vineyards, where I’ve been learning about vineyard management through a series of hands-on classes, owner and winemaker Scott Elliff has a similar perspective. He’s picked the Viognier, and is grateful to have those grapes in the barn. Some vineyards, he noted, were delayed by rain, and by the time crews arrived to pick, the crop was lost. Reds are a different story. With Cab Franc and Petit Verdot, Scott is holding out. “We are seeking to maximize ripeness and maturity and not ‘just’ get to acceptable Brix levels,” he said. We were pretty ruthless in deciding which grapes to keep, but it was worth it. They could not be more beautiful. Can't wait to go back to Blenheim next year and taste the wine. However, “it’s a crapshoot,” he added Friday, especially after looking at the forecast that morning. He wants to bring the grapes in when they’re as close to perfect as possible – and that means more than the right balance of sugar and acidity. Julien Durantie, DuCard’s vineyard manager, said that even though the numbers were decent, the Cab Franc grapes still have green seeds. The green color means the seeds aren’t fully mature, which imparts a bitterness to the wine. And of course, there’s so much more to the decision about when to harvest. You can measure the Brix with a refractometer, measure the pH and look at the seeds. But Brix is just a measure of sugar and potential alcohol, and you can add sugar to the fermenting wine to correct for low Brix. A good winemaker also brings his or her experience to bear on the decision about when to harvest, and of course, they never really have full control.